The finely appointed Eraeliya Villas is high on the luxury factor. Step into this exquisite vacation rental, and you’ll set sight on an expansive outdoor compound, cavernous living spaces, plush amenities, and stunning views out to the ocean. Set along a secluded beach in Weligama, you’ll enjoy the tranquil vibes of this coastal paradise along with its excellent surfing waves. Beach lovers, avid surfers and sun seekers will have plenty of reasons to rejoice. 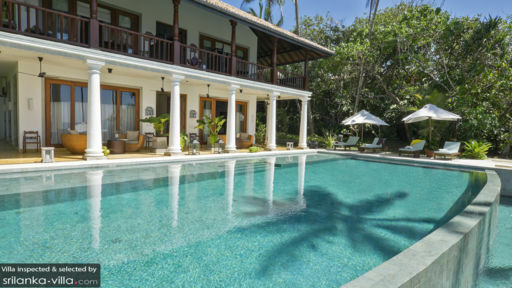 This commodious complex houses nine bedrooms in five stand alone villas: four bedroom Villa Bawana, two bedroom Villa Walauwa, as well as the one bedroom Villa Nelum, Villa Muhuda Bella and Villa Ambalama. 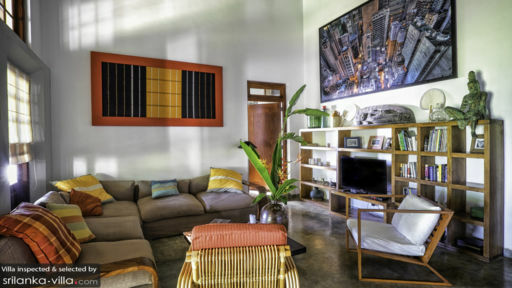 Each villa is furnished with a unique flair, and is thoughtfully decorated with a collection of antiques sourced across Asia. Flip through the channels on the flat screen TVs or tap on the Wi-Fi for pre-bedtime entertainment. Your belongings are kept secure in the electronic safes, and the addition of tea and coffee making facilities ensure that you’ll begin each morning on the right note. Unwind with a hot shower or soothing soak in the beautiful en suite bathrooms, all of which offer double vanities, rain shower alcoves and quality bath amenities. Some of the en suites feature free standing tubs, and all bedrooms, with the exception of Villa Ambalama, are outfitted with air conditioners. Relaxation comes easy in the verdant outdoor compound at Eraeliya Villas. Take laps and dips in the sparkling infinity pool, bask under the sun upon the loungers or enjoy quiet afternoons on the spacious wooden deck. Wherever you look, you’ll be greeted by a postcard-perfect sight made up of towering palms, leafy foliage and the boundless ocean. You won’t have to lift a single finger at Eraeliya Villas thanks to the superb staff and impeccable service, leaving you free to enjoy all the luxuries that the villa has to offer, like its gorgeous living spaces, and breezy terraces. The decor features an exotic blend of local and Asian architectural styles to create a look that’s contemporary and classy. 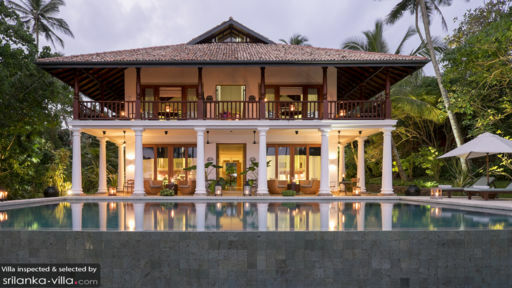 Eraeliya Villas is a full-service property tended to by a team of 24 staff. Personal guest services, along with housekeeping, gardening and security service are provided. Laundry, in-villa massages, private driving services, private chef services and airport transfers are available at additional cost. Weligama is a fishing village located in South Sri Lanka. While the highlight here is Weligama Bay, a beautiful coast with excellent surf, there’s more to Weligama than the beach. Families will appreciate the town’s relaxed, laid back vibes, water sports (the area is ideal for snorkeling and diving too), family-friendly dining venues and cultural attractions. It’s also a great base for making day trips out to popular attractions Galle Fort, Mirissa Harbour, Yala National Park and more. The best months for surfers to catch a wave at Weligama Bay is between end September till the end of May. The reef breaks here are suitable for beginners. Advanced surfers may head out to the reef point break at Midigama, a beach town located within Weligama. Away from the beach, stretch it out on the mat at drop-in yoga classes conducted at Surf & Yoga Mirissa, Greenpeace Inn and Gangarama Temple. Soothe the aches and tension in your body with a spa ritual at venues like Cape Weligama or Quan Spa (located at Weligama Bay Marriott Resort & Spa). The former features treatments like scrubs made from organic local herbs, essential oil massages and herbal steam treatments, while the latter features a wide-ranging array of services - from massages and body wraps, to facials, scrubs and manicures. Weligama’s dining scene offers a variety of options to suit different tastes and moods. We’d recommend Cape Weligama for a fine dining experience; the hotel has three on-site venues, Cape Club, Ocean Terrace and Ocean Grill, and each offers a unique setting and menu. For a more laid back and fuss-free dining experience, check out casual eateries like Hangten Rooftop Restaurant, Aloha Home & Kitchen and Blue Lagoon Seafood Restaurant.